Pope Francis has a message for young people preparing for World Youth Day 2019: Ask God, “What do you want from me?” and allow God to answer you. Source: Vatican News. The Holy Father’s message to young people in preparation for WYD, to be held in Panama in January, is centred on the theme: “I am the servant of the Lord. May it be done to me according to your word”. The message, published on the day of the celebration of the Presentation of the Blessed Virgin Mary yesterday, concludes a cycle of three Marian messages dedicated to young people along their journey from WYD 2016 to WYD 2019. For the first time, the Pope has released a video message for WYD “so that it can reach the greatest number of young people; and respond to their desire, expressed during the recent synodal process, to communicate with the Church through forms closer to their own language”, a Vatican statement said. 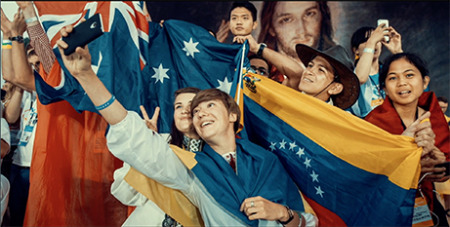 In the video, Pope Francis addresses all young people of the world — believers and non-believers. It recognises the willingness of young people to serve others and invites them to put this attitude into practice from a Christian perspective: “To be at the service of others does not only mean to be ready for action. It means also to be in conversation with God with an attitude of listening, just like Mary. She listened to what the angel said to her and then she responded,” Pope Francis says.